North Carolina Lt. Gov. Dan Forest to speak at GTCC’s 52nd commencement ceremony on May 10. JAMESTOWN, N.C. — Guilford Technical Community College announced today that North Carolina Lt. Gov. Dan Forest will speak at its 52nd commencement ceremony. The event will be held at the Greensboro Coliseum on May 10 at 7 p.m. More than 1,300 students are expected to receive degrees at the ceremony. 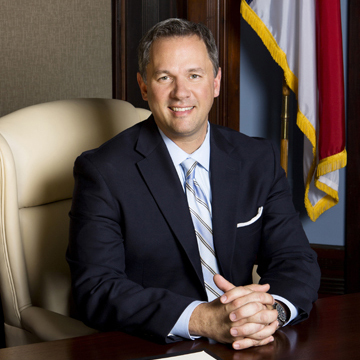 Dan Forest has served as Lieutenant Governor of North Carolina since January 2013. He serves as President of the North Carolina Senate and is a voting member of the State Board of Education and the State Board of Community Colleges. On the State Board of Education he is Chairman of the Special Committee on Digital Technology, which is tasked with implementing the state-wide digital technology plan. Forest is also a member of the N.C. Advisory Commission on Military Affairs, the Food Manufacturing Task Force and serves as chair of both the Energy Policy Council and the Board of Postsecondary Education Credentials. Forest holds a degree in architecture from the University of North Carolina at Charlotte and formerly served on the UNC Charlotte College of Architecture Advisory Board. Prior to becoming Lieutenant Governor, Forest was a leader in the business community for over 20 years, having served as Office President and Senior Partner of the state’s largest architectural firm – Little Diversified Architectural Consulting.